Remember when you were a little kid, and on Christmas morning you'd sprint down those stairs to open up your presents? As you sat there ripping off wrapping paper there was always that inevitable disappointment when you opened up the socks, thinking it was a Transformer. Well that kind of sums up how I felt about the Homerun American Pale Ale. Don't get me wrong, it's fine enough, it's just that I was expecting more I guess. 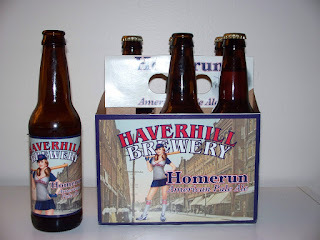 Haverhill Brewery is a local brewery (for me at least), which made me want to love it that much more (gotta support the local guys right). It was good, just not knock your aforementioned socks off good. I was expecting lots of hops, and got maybe one hop. Nothing about the flavor, aroma or color jumped out at me. The only thing I really noticed was the aftertaste which wasn't all that great and just wouldn't go away. The best thing about this beer? The label... can't go wrong there. Next time, I suggest they put more effort into their beer though, and less into the advertising (although I guess it worked on me). I'm going to give the beer a blah 2. Sure it's beer, it'll get the job done, but I won't be running out to grab another six pack.